If your old electrical panel is no longer functioning properly, it can be endangering your home and everything inside it. Read on for the various warning signs you should be looking out for. Even an old electrical panel is an improvement over fuse boxes (these can no longer keep up with the energy demands of today’s households), but if it’s getting to be a bit too old, you may need to look into replacing it. The panel is responsible for taking power from the main line outside and directing it through your electrical system. There are a few potential causes for circuit breakers that trip more frequently than usual, but this could be a sign your panel has been worn down and needs repairs — or a total replacement. If this issue persists, you should contact an electrician to help you determine whether or not the panel is still functioning properly. When you reset a breaker that has tripped, it should stay that way. You should never have to reset the same breaker over and over again, and if you do then something is wrong. If the breaker doesn’t stay reset (or if it only remains reset for a few minutes before tripping again), the panel itself might be the issue. It is also a warning sign if the breaker remains in a reset state, but the shut-off power doesn’t come back on. 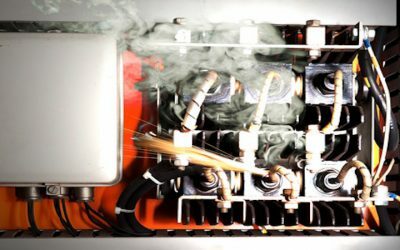 When an electrical panel’s wiring wears down too much, fires can actually occur inside the panel. This might sound like something that can be difficult to miss, but the fires are small and typically burn themselves out quickly. In spite of this, they usually leave behind signs that they’ve occurred, such as acrid, burning smells from the panel, scorch marks around the breakers and components that are hot to the touch. If you identify signs of an electrical fire in the panel, it needs replacing as soon as possible. For your own safety, it is important to contact a professional immediately if you detect any of these signs. When your old electrical panel needs replacing, an experienced electrician can ensure the job is done correctly and safely. For help with your old electrical panel, or for more information about the various danger signs you should be looking out for, call Bryan Electric at (770) 680-2144.